People who have heard my stories find them hard to believe. Let me assure you that each one happened in its own, remarkable way. Just how I managed to conceive of such adventures, step into the unknown, travel the globe, and stay alive is a puzzle to me. When I wrote my book, "Dangling Without A Rope", my hope was that it would unravel the mystery of how a timid, sheltered girl became a wild, crazy woman of the world. While my peers were raising families and securing successful careers, I spent decades of my life in a world of outdoor challenge and excitement—single, curious about the planet, and totally mobile. One year I lived in 17 different dwellings. I also lived in vans, campers, trucks, cars, tents, yurts, huts, caves, and the out-of-doors. Often, the sum total of my belongings could fit in a VW Bug, sometimes a backpack. For every story that you read in "Dangling Without A Rope" there are 10 more waiting to be told. Between adventures I worked an absurd variety of jobs—chamber maid, salesgirl, au pair, gardener, grape and apple picker, ski teacher, coach, translator, florist, massage, real estate agent, sled-dog racing consultant, kennel hand, secretary, switchboard operator, legislative assistant. When not earning a meager wage so that I could travel third class around the planet, I engaged in extreme sports. I climbed rock, mountains, and ice. I raced sled dogs, kayaked rivers and oceans, cycled alpine passes, piloted a hang-glider, flew an airplane, surfed, scuba dove… I competed every chance I got. I lived in a world of men. Women were simply not yet on the scene. My adventures were dangerous. Luck was my constant companion—along with a good dose of naiveté. My greatest challenges came later in life and not out in the wide world. They are long-term Lyme Disease, Breast Cancer, and Mild Traumatic Brain Injury. Boy, did they try to crimp my style! Sixteen years ago I became mortally ill. For seven long years, I dragged my wilted body from doctor to healer to researcher to spiritual guru, never being tested for Lyme. One day I read an article about a woman like myself who discovered after many years of misdiagnosis that she had Lyme Disease. I found a Lyme-literate MD and was diagnosed immediately. Because my neurological symptoms were so severe and I had gone untreated for so many years, my prognosis was dire. I have used all the lessons I have learned and put all the heart I have gained into surviving – and sometimes even thriving – with the worst disease I could ever imagine. sufferers and those dancing with cancer and brain injury. There is always hope, even in the little things of daily life, and so much love awaits each and every one of us. You can purchase "Dangling Without A Rope" on Bobbe's Website or on Amazon. You can ~ Contact and Like her page as well ~ She would love to hear from all of you! 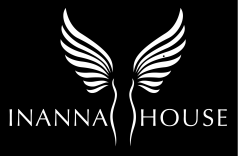 Click on the Twitter icon to tweet about Inanna House, Artist of the Month, and Bobbe ~ The more awareness the better!